Last month (yes, it has taken me that long to do this post) an old friend of mine from college emailed me to ask for my advice on how to decorate her office. 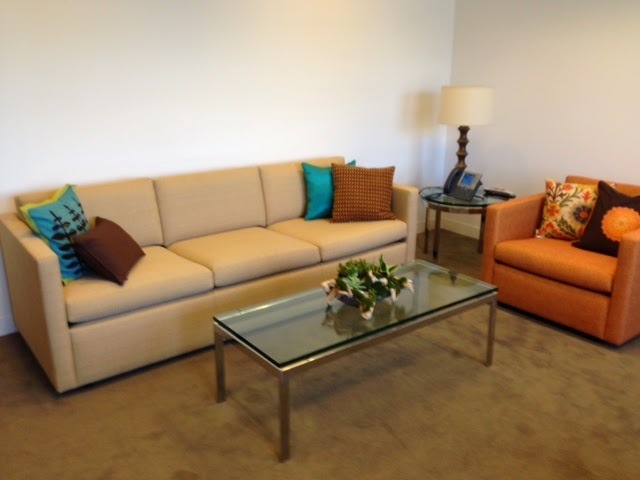 Lindsay is a television exec in Los Angeles and has a large office that could use some love - but she is not able to change the furniture or paint the walls. As always, I am up for a challenge! This is what it looks like now. 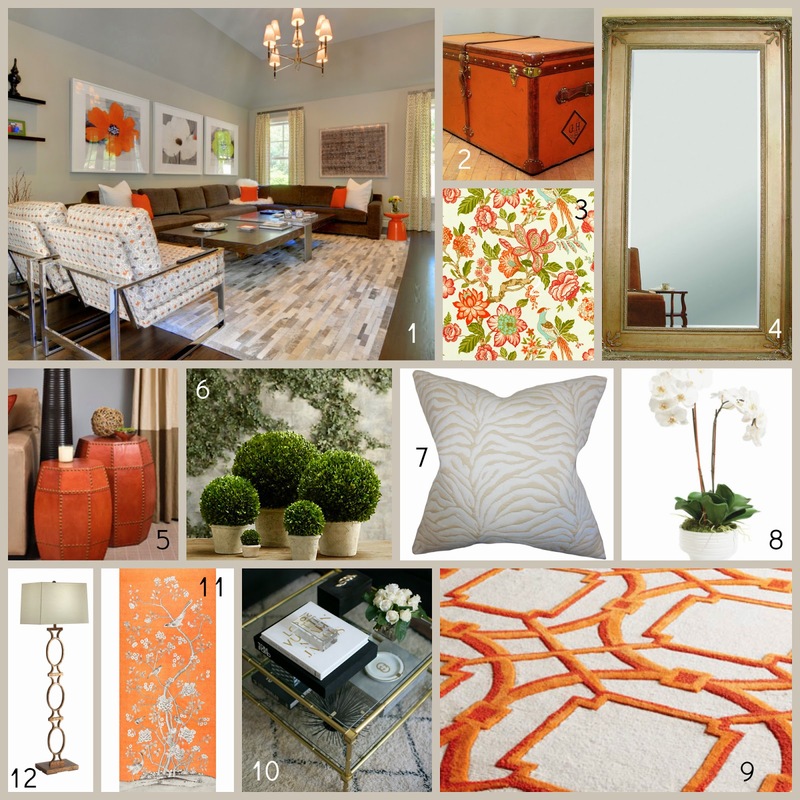 And here is the inspiration board I created for this space. 1. Since Lindsay told me she likes warm autumn colors and because her office already had a lot of orange in it, I decided to embrace it and go for an orange theme but with a lot of white, green, gold and brown to keep it from becoming too overwhelming. Picture number one is my inspiration picture from Houzz. The first thing that needs to be addressed is the brown carpet. 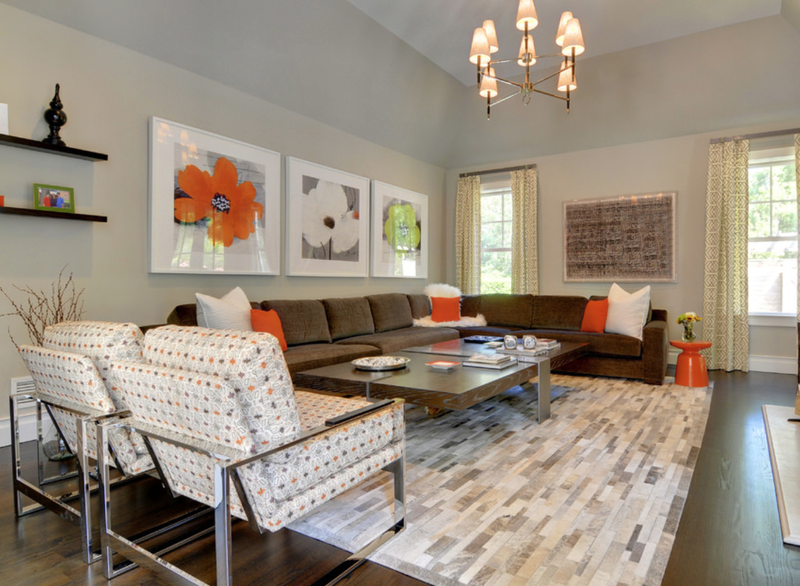 Because that cannot be changed, I suggest Lindsay add a large area rug to the space under the couch, chairs and table. 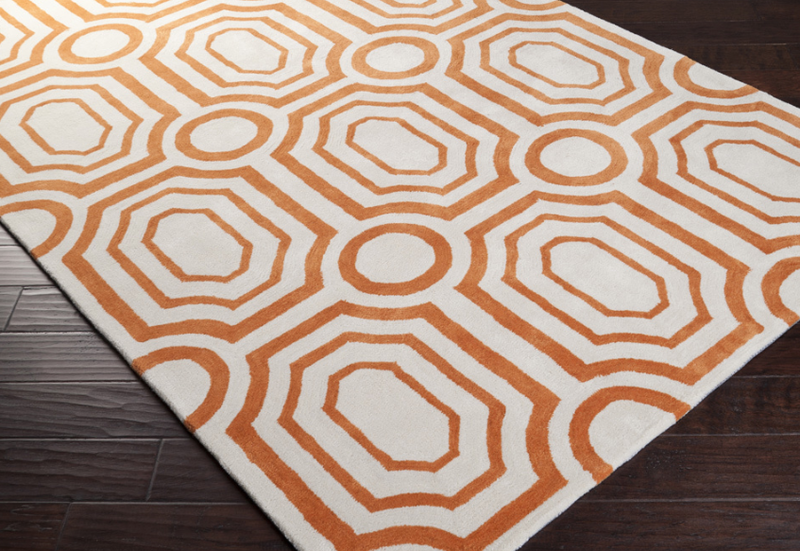 You'll see later on in #9 below that my first choice is this Horchow rug. But there are a million options. Here's one that I found on Overstock that is much less expensive and still would be a good base and is a steal at $240! I picked this as my inspiration room because of the neutral colored walls and the basic couch - both of which Lindsay has in her office. 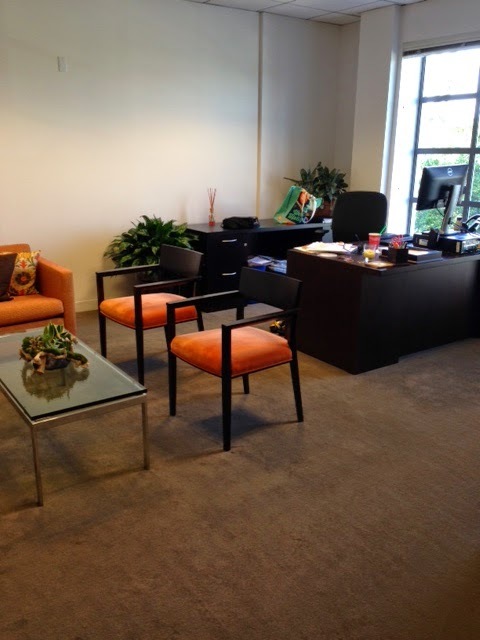 Consider it a blank canvas and because the large space, the orange in the picture, and in the office, won't be obnoxious. I am in love love love with the artwork behind the couch and I think this would be perfect in Lindsay's office above her couch. The bright colored flowers with a simple white matte and frame would be to die for. 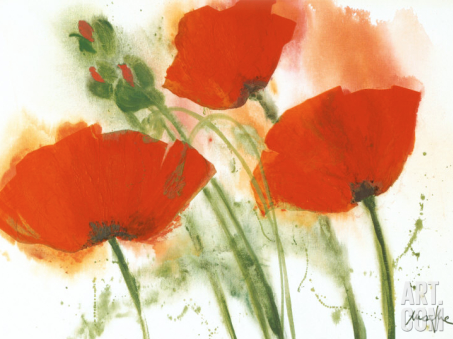 Here's one I found on art.com that is a little more abstract but could work nicely as well. 2. Ok so this was really just for inspiration but can we talk about an orange vintage Louis Vuitton trunk? LOVE this! Wish I could live inside it. 3. 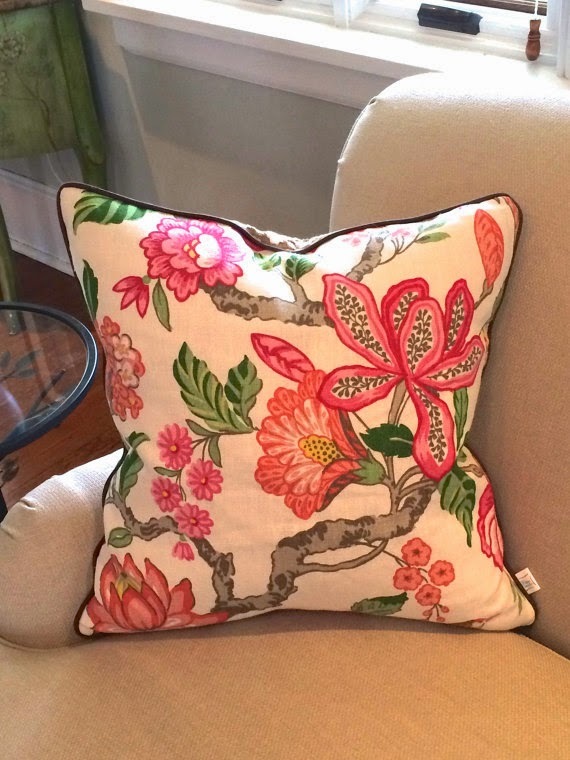 This great fabric is from Schumacher and is their Huntington Gardens pattern in Coral. I would have two really large pillows made in this fabric for either side of the couch. This one from Etsy is the same pattern but with more pink tones. I like the brown piping on it and would love to see a different pattern on the back. 5. Since there's no way we could actually find or add the Louis trunk, I like these as a fun alternative. These are sold by Maze Home and retail for $230. 6. I am a big, big fan of topiaries like these from Restoration Hardware. They are clean, simple and add color without need much (ok..ANY) care. I suggest a group of three of these on the coffee table. 7. I love these taupe and white zebra print pillows. I would add one to each of the orange and black chairs to lighten them up and make them comfy. 8. As you can see in the pictures of the office, Lindsay already has some healthy looking plants in the office. I would add a few orchids like this one to balance out the black furniture and the orange. We all know these can be temperamental but they are well worth the effort. 9. So this is the rug I mentioned above from Horchow. The size that Lindsay would need in that space runs about $2,500 which I think would be totally worth it given how much time we all spend in our offices. But again, you do NOT need to spend that much money and can easily find something just as nice and cheaper. 10. 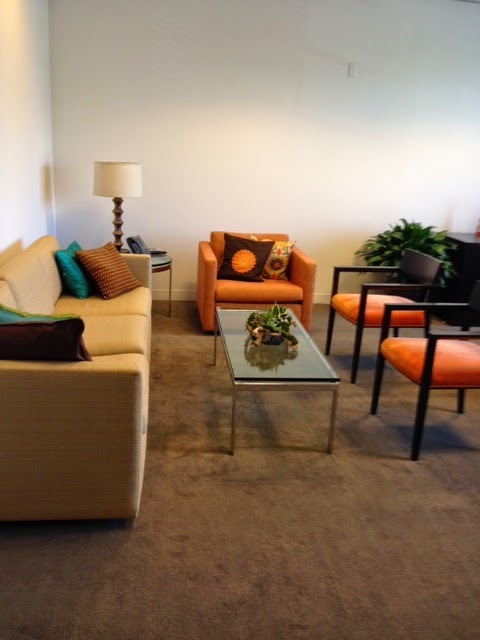 I really like the look of the coffee table in Lindsay's office - it goes well with all of the elements above. Styling it should be fun. Lots of coffee table books for people to peruse while waiting for meetings. 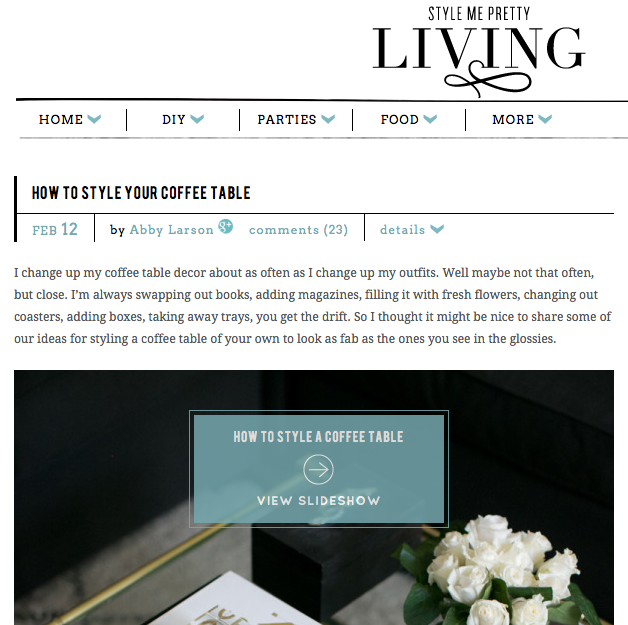 Here is a great article from Style Me Pretty on coffee table styling - yep, it's a thing. 11. 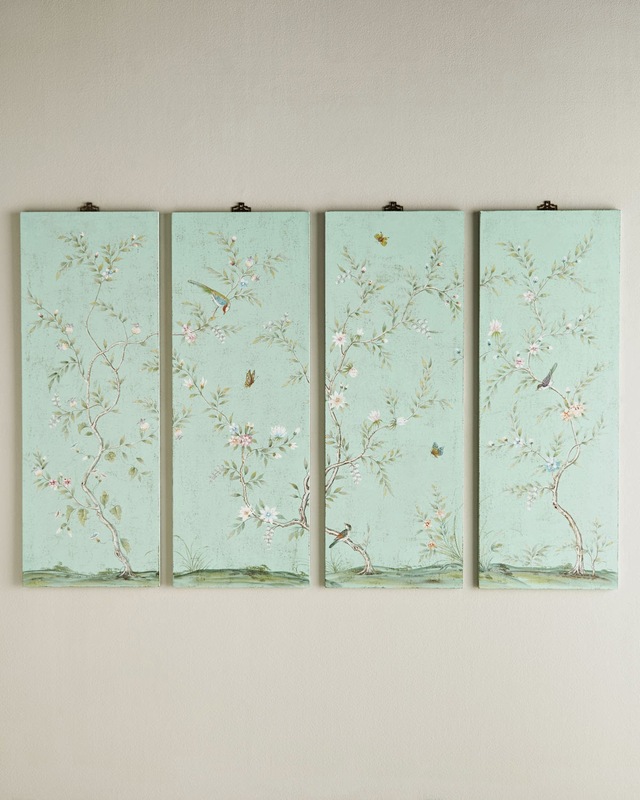 Behind Lindsay's desk you can see a big open wall and I suggest a large scale piece like this four panel fabric. When I put together the inspiration board, I found the fabric in the #11 picture on the Schumacher website. It's called the Chinois Palais in Tangerine and I had this vision of someone (not me…and probably not Lindsay herself) buying the fabric and then covering three or four canvases to make a giant art type thing without spending fortune. BUT then I was peruse the inter webs and found this on the Horchow site for $750 and I say why DIY when someone else can do it better? It comes in a pretty coral color but actually I love the turquoise one below. I think it may be even better and will still go really nicely with the overall color scheme of the room. 12. I've said this before and I will say it again, there is nothing more important in ANY room than lighting. It makes or breaks any decor, sets the mood and makes the space. I love these lamps from Ethan Allen called the Owen Ringed Floor Lamp which they sell for $879 - another expensive piece especially for an office. I found a less expensive version on Overstock (where else?!) called their Gold Leaf Moroccan Floor Lamp for $198. So that is my suggestion for Linday's office. It will be light and bright and a gorgeous place to spend the days. If you have a room that needs help and you want my advice, email me at allie@designingontheside.com.